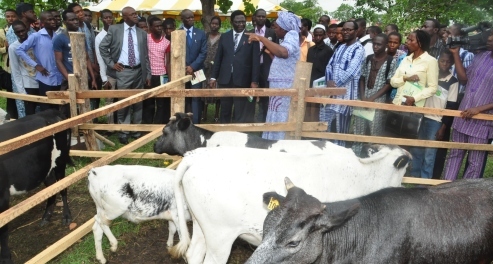 The Chief War Marshal of Man O’ War, Federal University of Agriculture, Abeokuta (FUNAAB), Professor Idris Ayinde has charged Nigerian youths to utilize opportunities at their disposal to become entrepreneurs, saying entrepreneurship remains the potent tool to fight the scourge of unemployment currently ravaging the country. Professor Idris made the call while delivering the lecture titled “Tackling Unemployment through Entrepreneurship” during a 3-day Pre- NYSC Orientation Camping, organized by the FUNAAB Man ‘O’ War, recently. Professor Idris, who doubles as the Head of Department, Agricultural Economics and Farm Management (AE & FM), College of Agricultural Management and Rural Development (COLAMRUD) described entrepreneurship as a business concern floated by an individual or group of persons for the sole aim of generating income rather than waiting and relying on white collar jobs, which are non-existent. The War Marshal identified four basic ingredients of entrepreneurship as Time Management, Stress Management, Sales and Networking as well as Person Conviction: While laying emphasis on the development of individual talents and potentials as a panacea for growth in entrepreneurship, the lecturer advised that one does not necessarily have to start big because starting small can help minimize unnecessary loss. Earlier, the Dean, Student Affairs Professor Babatunde Idowu, had declared the camp open by lighting the campfire and charged the participants to take the camping activities serious. Activities during the 3-day events included Endurance trek from the University Campus to Camp junction and back, Aerobics training, parade training, gadgets training which were similar to that of the NYSC Camp such as Tarzan jump, Burma bridge, barbed wire crawl. Participants were also taken through a practical session on how to produce paints. Miss Ayobami Salaudeen, a participant and final year student of Animal Production and Health (APH) described the event as wonderful, adventurous and educative, adding that she enjoyed every bit of the activities at the camp. She eulogized the organizers of the programme saying such should be organised yearly for final year students preparing to serve their fatherland. In his address, the Coordinator-In-Chief Man ‘O’ War, FUNAAB Command, Patriot Lekan Adefolahan said the programme was organized to prepare FUNAAB students ahead of NYSC Camping. He appreciated the University Management for the support to hold the programme on campus.